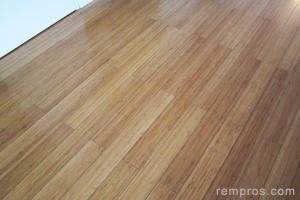 Both laminate and bamboo flooring options are widely used in different house areas except maybe bathrooms. These floors are also a healthy choice for those who suffer from allergies. In addition, bamboo and some laminate are eco-friendly materials which give some peace in mind for homeowners who plan to go green, but still want something natural and elegant or at least very close to that. Also bamboo and laminate are very good alternatives to hardwood floor when it comes to the cost. Bamboo is considered as one of not very expensive flooring options compare to hardwood, for instance. People love bamboo because of the feel and look of it. It is a beautiful, durable, and long lasting flooring material which earned its respect and trust for years. Natural colors of bamboo flooring is generally more durable, however, there are lots of other stains available on the market that can satisfy any taste. The floor has good abrasion resistance and decent scratch resistance which make it possible to install bamboo even in such high traffic area of the house as a kitchen and hallway. As any other wood flooring material it has relatively high moisture resistance as long as the water won’t stay on the floor surface for hours. Even though, bamboo floor is not a wood it can be refinished and stained again to return the floor its excellent look and prolong its performance. It is not too sensitive to humid. Therefore, it doesn’t have as much seasonal shrinks and expends as hardwood. Laminate vary from cheap to pretty much expensive options which make it affordable for any budget. Despite the fact that laminate flooring is a man-made material, it has good quality and decent look, especially if it is a product with typically higher price. Laminate has excellent stain and moister resistance. It is a durable flooring material for the cost. The floor has good abrasion resistance also and doesn’t require high maintenance. More expensive options of laminate flooring have comfortable feel to the feet as bamboo floor. The laminate floor goes in different colors and can emulate any natural material in virtually any style and patterns that give it look as almost any flooring materials that available today. This kind of floor is relatively easy to install even as a do it yourself project. Laminate flooring normally do not fade, scratch, dent, or warp as easily as bamboo floors. Despite the fact that some kinds of bamboo are harder than white oak (hardwood floor), it is still can dent and scratch as any other wood flooring option. If it installed not properly it can make noise. Bamboo planks that are darker in color are generally softer which lowers its durability. On the other hand, natural colors of bamboo are most desirable, but most expensive which can be not affordable for many people. Cheaper, versions of bamboo flooring are generally poor in quality. Least expensive options of laminate floor might look cheap. If you go with laminate which has low price you might need to replace it in as little as 10-15 years. Laminate flooring intended to be changed when it has worn out, whereas bamboo can be refinish. In addition, despite the fact that laminate can be installed in such wet areas of the house as kitchen and bathroom warranty might be voided if excessive water will damage the flooring.